Maison Martin Margiela 2011 eyewear collection. 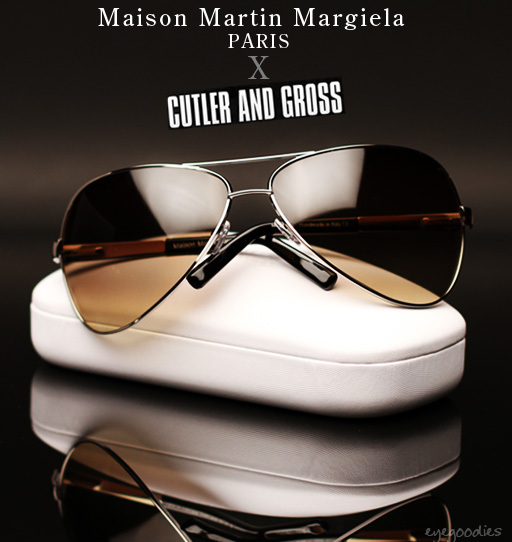 Eyegoodies is pleased to welcome in the new collection of sunglasses from Maison Martin Margiela. The experimental, provocative, avant garde French fashion label Maison Martin Margiela teams up with praised manufacturer of luxury handmade eyewear, Cutler and Gross, for their first full collection of sunglasses. The collection features two distinct concepts: “Anatomic” and “Wrong Size” both offered in an acetate and metal variety. The Anatomic range features extra-large futuristic, functional wraps. These shades anatomically wrap around the wearers whole face providing absolute coverage. The “Wrong Size” range highlights Martin Margiela’s pension for deconstruction and the experimental. Classic Cutler and Gross frames are deconstructed then reconstructed again with wrong sized lenses; making for a decadent distinct pair of sunglasses. New in from Paris France, Thierry Lasry’s exquisite 2011 Spring/Summer collection. Thierry Lasry is making some of our favorite sunglasses right now. Chic, fashion forward, and only found at a few of the most exclusive boutiques world wide. The new season features classic shapes that are refined to feel fresh and current. There is great attention paid to every design detail, from the fit to the high quality acetate chosen. The colors range from classic staples such as black and Tokyo Tortoise to the exotic (crafted from rare sheets of vintage Italian acetate). Handmade in France, supply limited.